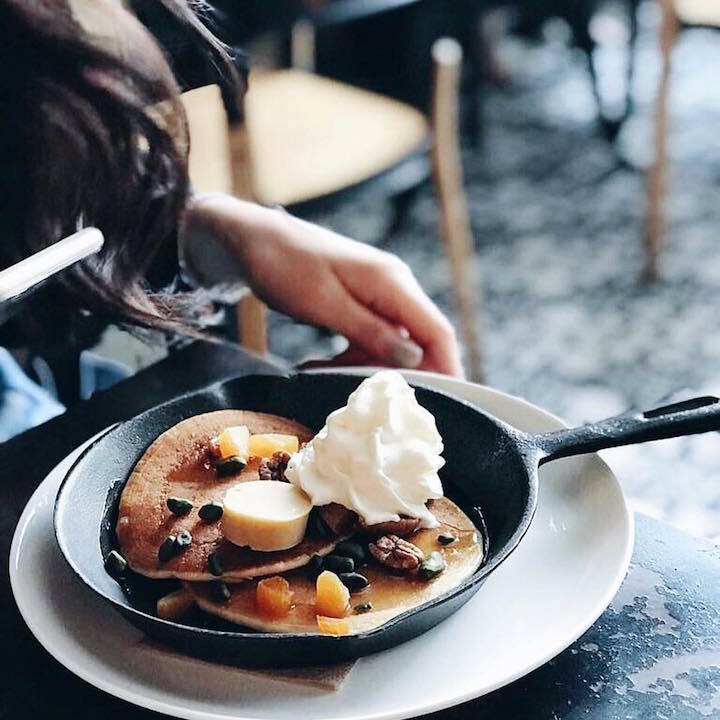 We’ve done the legwork for you and rounded up the very best breakfast spots in the city, perfect for your every morning mood. If you’re looking for a heavenly coffee to help kick start your morning, NOC is the place for you. If you have time to spare, make sure to indulge in one of its house-roasted specialty coffees, along with a top-notch brunch dish. 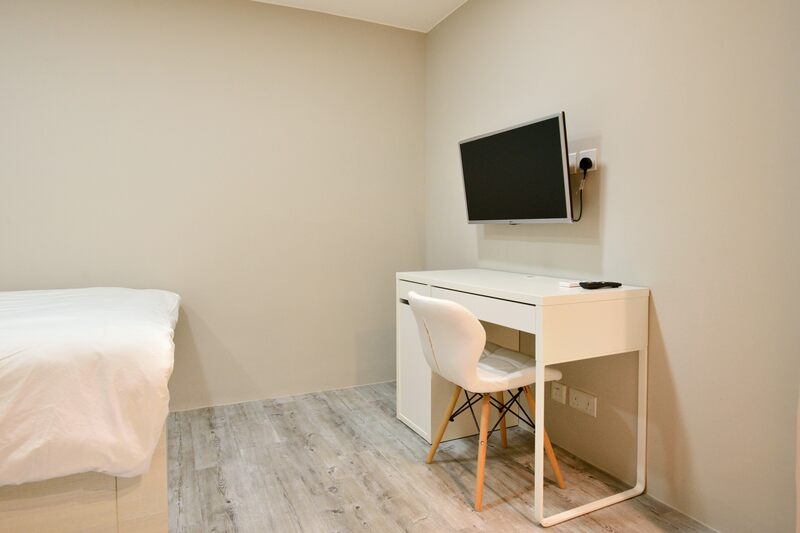 The location in Sai Ying Pun serves up favourites such as an All Day Breakfast, its own special take on Avocado Toast and more, all using the best possible local and organic ingredients. In a rush? 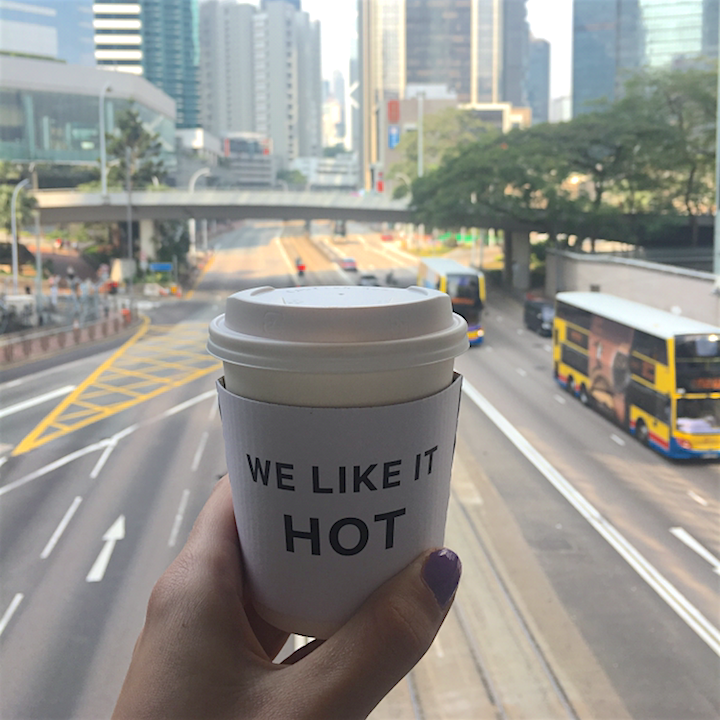 NOC has six locations across Hong Kong, so there’s always one closeby to pick up a coffee and a pastry on your way to work! Make sure to also sign up to NOC’s digital loyalty program here to receive your 10th coffee free, along with other perks. We’ve scanned more sarnies through the tills here than we’d care to admit, but it’s worth having a mosey at Pret’s breakfast options, too. Those with a sweet tooth will no doubt opt for the honey granola pot; while bacon and egg baps will hit the spot on your commute. Pret even offer some cool substitutes for milk in your morning latte – coconut milk is worth giving a go! 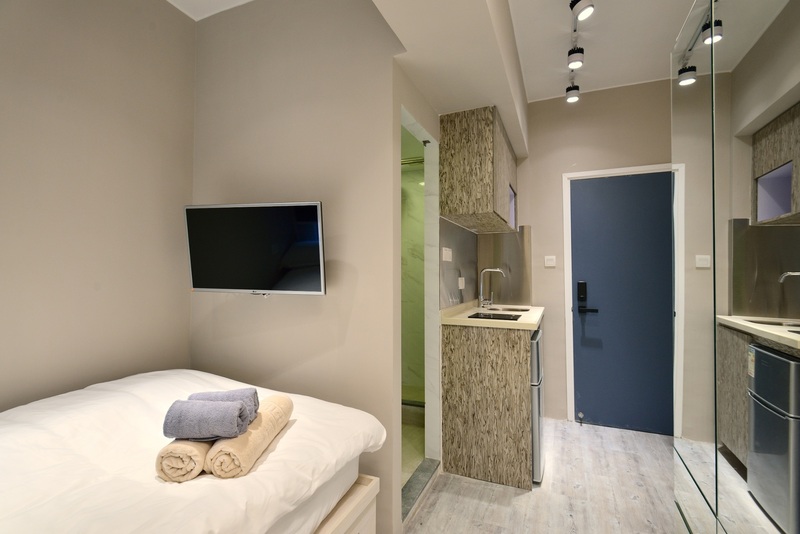 Open from: Opening hours vary between locations – find more info here! 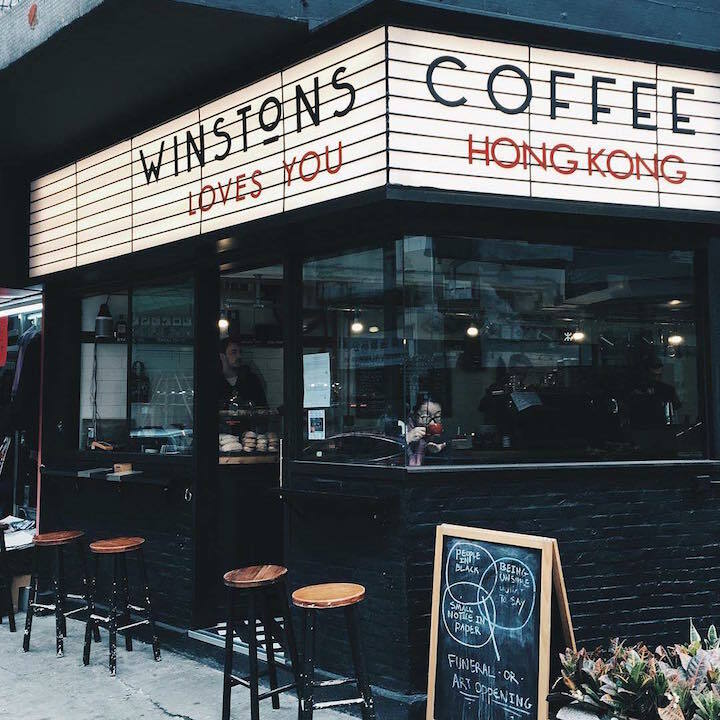 This Aussie-style coffee shop exudes seriously hipster vibes, offset by hordes of Hong Kongers grabbing a quick bite and a cappuccino before heading off on a hike or going about their weekend. Its combos are great value, offering coffee and a bap, power bite or muffin for $55, as well as avo and cheese toasties, sausage rolls (10/10 recommend) and a plethora of baked goodies (can’t go wrong with a pain au chocolat). 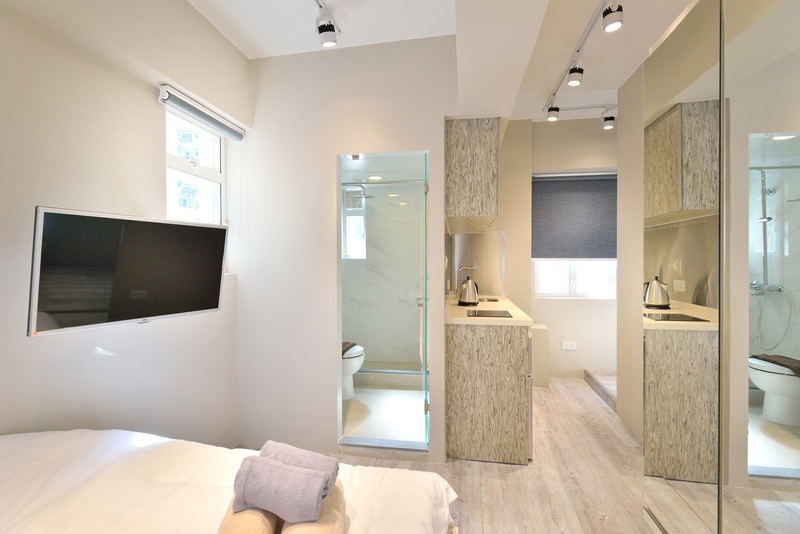 Small but sweet, Winstons serves up a mean morning brew everytime at its locations in both Kennedy Town and Sai Yin Pun. Feeling like a quick coffee and pastry to ease those Monday morning blues? Passion is where to head. Or if you really need a pick-me-up, make sure to try out the chocolate chaud. There is seating upstairs and some tables outside, but we love taking away a loaf of the crusty sourdough for an indulgent treat at home. Another great pit-stop for artisan bread and pastry in Hong Kong is Maison Eric Kayser. Offering up delectable French pastries, breads and freshly prepared sandwiches, along with great coffee, it’s one breakfast spot that is always on our radar. For a grab-and-go option, stop by for the express breakfast, which includes a black coffee and a croissant for $30, or $35 for a latte. 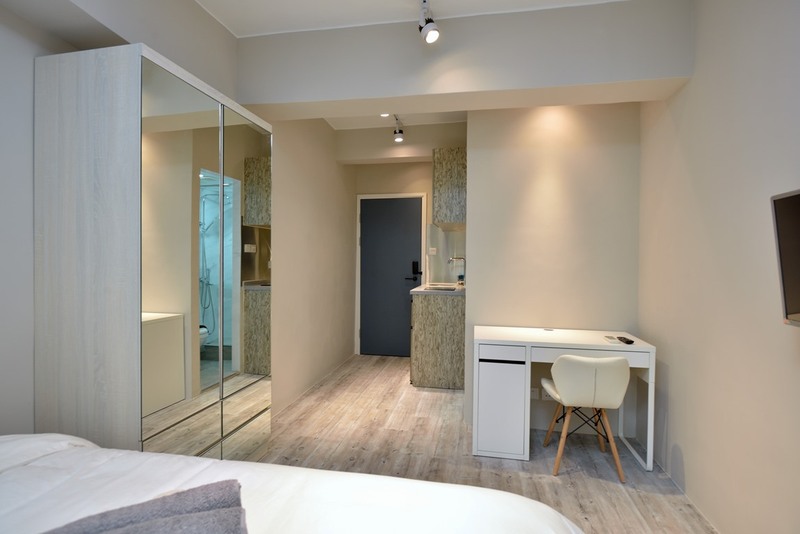 A staple for Brits craving home-comforts (and Percy Pigs), Marks and Sparks actually have some pretty great breakfast options for when you’re in a pinch. Pre-sliced fruit, yogurt, Bircher Muesli pots and sausage sarnies (a hangover staple), are but a few of the options on offer. Admittedly you don’t bag quite the same value for money when you convert currencies, but do check out what’s on offer in the meal deal department before hitting the tills. 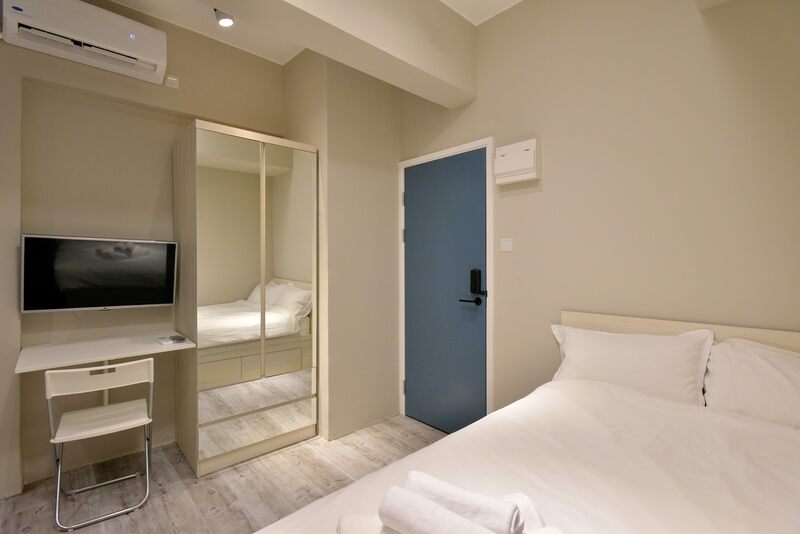 We frequent Knead in Sheung Wan often for its selection of make-your-own sandwiches and salads, but it’s a great place to drop by for brekky too. Go for the fried egg sandwich and add either avocado, bacon or tomatoes for just $30 for half or $50 for a whole. Great value and delicious. What better start to the day is there than a bagel fully packed with delicious fillings? We’re big fans of the SchReuben (with brown mustard, beef pastrami, sauerkraut, swiss cheese) and the Loxy Lady (with scallion schmear, smoked salmon, capers, red onion). Want to make your own? Schragel’s offer a selection of bagels, dips and spreads that can be purchased individually for you to make your own spread! With three locations across Hong Kong, BRICK LANE takes inspiration from proper British pubs (in both decor and food! ), serving up English comfort food and all day breakfasts. Expect a menu to please all, so round up your friends and try as much as you can, with dishes including English All-Day Breakfast, Eggs Benedicts, and even freshly baked Red Velvet Cakes! Open from: Monday to Thursday: 9am to 10:30pm; Friday: 9am to 11:30pm; Saturday: 9pm to 10:30pm; Sundays and Public Holidays: 9am to 11pm. Rarely a weekend goes by when we don’t find ourselves at Bakehouse. Helmed by Chef Grégoire Michaud, this bakery is far from run of the mill, with all of its baked goods made fresh onsite every day. Whilst its sourdough ($30) is some of the best in the city, we love trying out its new and creative twists on the classics which can often be found in the well-stocked cabinet. Must-tries of ours include the Sourdough Egg Tart ($12), Double Chocolate Cookie ($18), Almond Danish ($30) and Chocolate and Hazelnut Doughnut. If you’re wanting to eat in, the bakery also serves up delights such as Country Sourdough French Toast ($88) and Potato Rosti with Jamon Serrano, Manchego Cheese and Poached Egg ($128) in house, but be sure to get there early to beat the inevitable queues. For a touch of class in the mornings, head to Café Causette at Mandarin Oriental. 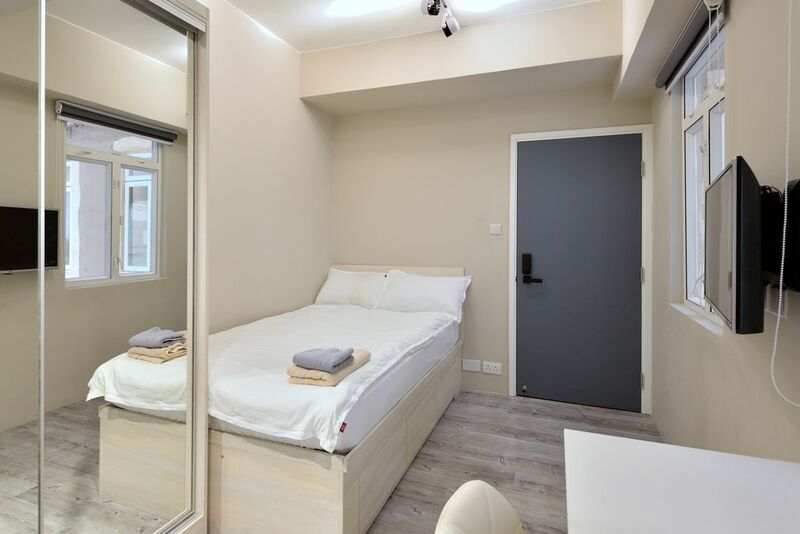 With a bright and airy atmosphere (sit by the window for a dose of natural light), you’ll thoroughly enjoy tucking into your eggs. For a taste of local cuisine, indulge in the Chinese breakfast – with assorted dim sums, congee, egg noodles and more. Tucked away on Elgin Street, Baked is worth seeking out this hole-in-the-wall cafe for its amazing baked goods. 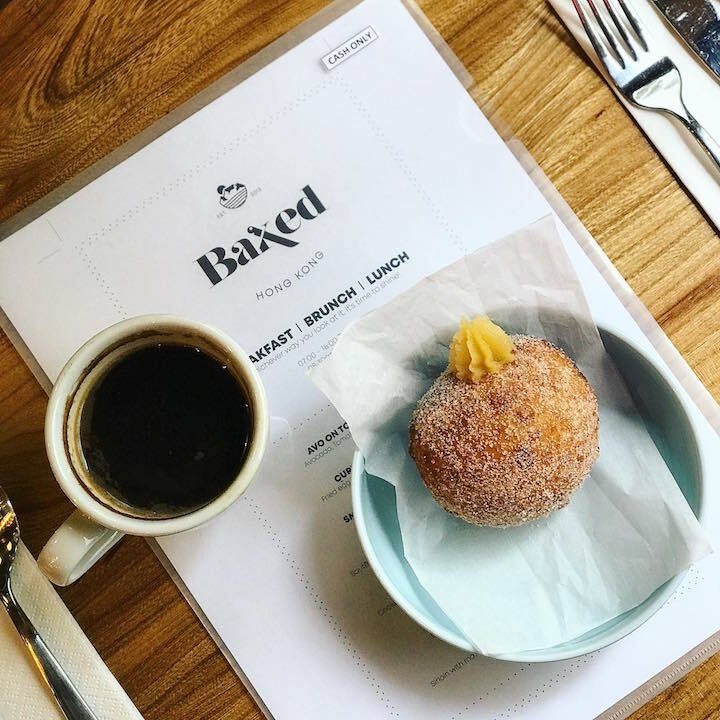 Its Instagram page is full of more than tempting brunch shots of dishes such as Cardamom Infused Overnight Oats, Baked Benedict, sourdough spelt doughnuts and picture-perfect sourdough loaves. Located on Queen’s Road East, it’s hard to pass by once you smell the expertly brewed coffee. 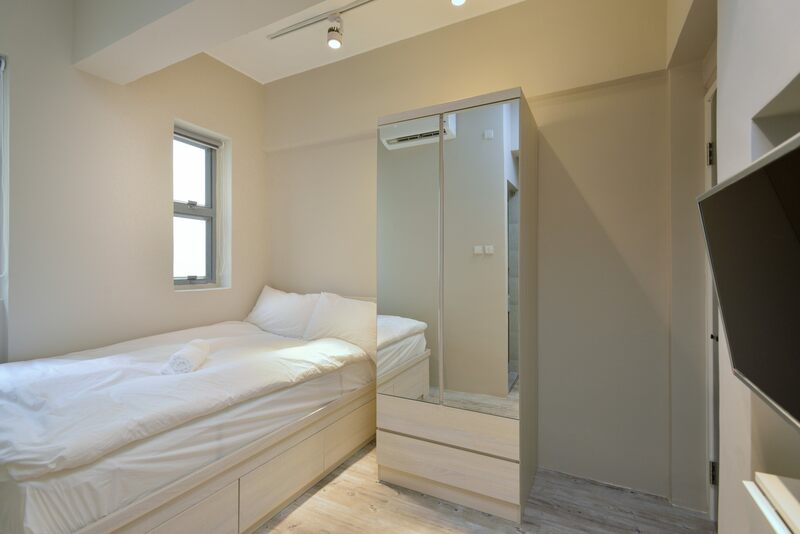 The interiors are also super cool, with countless lights hanging from the ceilings, and lots of chic bronze fittings. Breakfast options include Chili Scrambled Eggs on Charcoal Toast, and the indulgent Lobster Eggs Benedict. 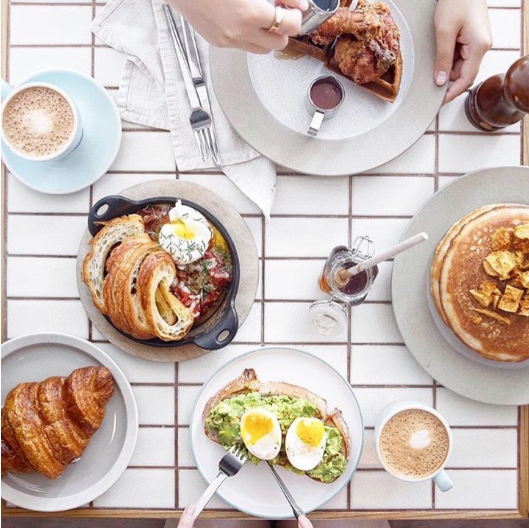 If you’re looking for the lazy weekend brunch spot – CATCH is your go-to for delicious brekkie bites and good coffee. You’ll find plenty of people who shout about its creamy avocado on Sourdough (tip: add smoked salmon) and Big Bad Ben – with poached eggs, bacon, avocado, chorizo, hash browns, hollandaise and siracha – and the Summer French Toast. Pair with a cheeky Bloody Mary and you’re as golden as your hash browns. If you’re someone who’s not that in love with breakfast food, or eating a tonne first thing in the morning, teakha has the perfect set up. While it’s known for its tea – the Masala Chai is some the best we’ve had at a cafe – it’s actually its scones that gets us in the door. If you are looking for something a bit heartier, we recommend the Huevos Rancheros Toast. Skipping bread? Opt for the Granola Yoghurt with Pear. If you are looking for an afternoon treat, rather than breakfast, the pies and cakes here are something special. With a gorgeous outdoor area at its Wan Chai location, Le Pain is a great choice for a lazy morning spent in the sun. Whether you’re going solo and enjoying catching up on a good book, or with a group of friends, we can’t get enough of the delicious breakfasts here. Erring on the healthier side? Opt for the homemade granola-topped Greek yogurt, or enjoy the simple pleasures of a soft-boiled egg and just-baked bread. A staple for breakfast, lunch and dinner, Classified (all of its locations!) guarantees quality food and the perfect ambience to relax in. While the eggs Benedict are a must-order, the smoothies are also nutritious and delicious! Served in a mason jar, the smoothies contain Hong Kong’s own grass-fed whey protein that promise to give you maximum energy boost. Say goodbye to your usual cup of coffee! One of our favourite local dim sum spots is One Dim Sum in Prince Edward and it’s perfect for a lazy Sunday morning. Go prepared to queue a little though, the doors open at 10am on weekends, but there will almost always be a wait. Perfect for working up an appetite. Our favourite items to order will always be char siu bao and siu mai, but we can never bring ourselves to leave without having at least one egg custard bun (no matter how full we are). Whether you’re in the mood for a sweet or savoury breakfast, Green Waffle Diner will always hit the spot. 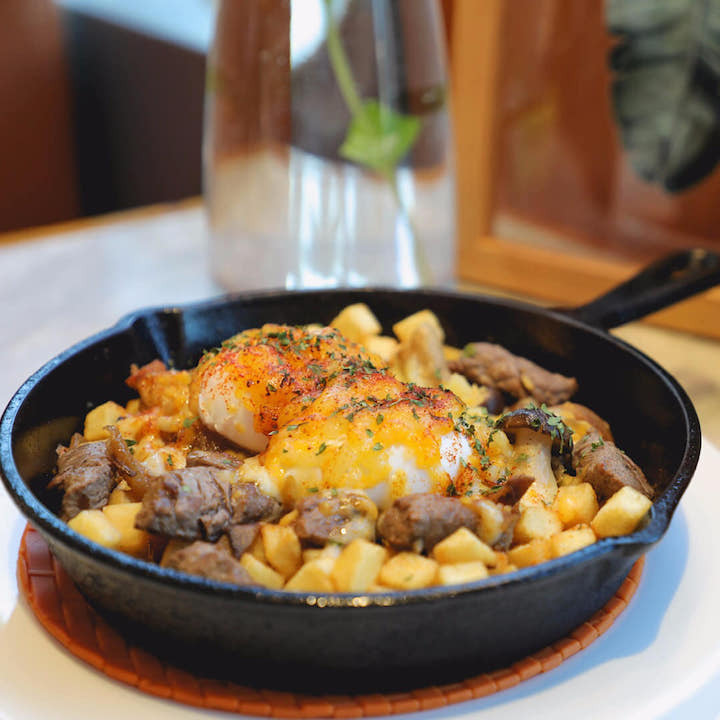 Its Country Brunch Skillet (a delicious mix of bacon, peppers, onions, home fries, poached eggs and melted cheese) is the perfect meal after a big night out. We’re also partial to its Pandan Pancakes, topped with a generous serving of condensed milk and whipped cream. Its milkshakes are also definitely not to be missed, though you can opt for some strong coffee or tea if you want something a little less sugary. This is an American style diner, so expect large portions and a healthy level of carbs! Waffles and pancakes can also be ordered gluten-free, which makes it a hit amongst our gluten intolerant friends. 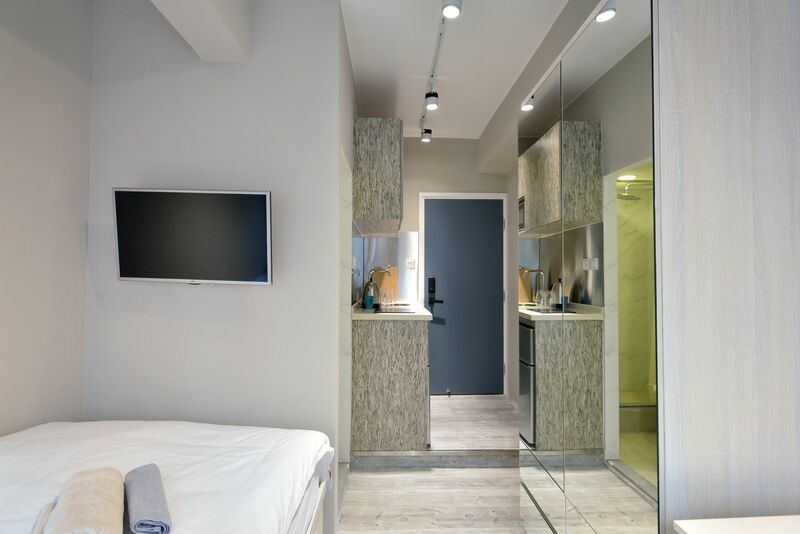 Had a heavy night and in need of a helping hand to get you back to health in the morning? Or just want to indulge a little? Morty’s in Central is your answer to all. 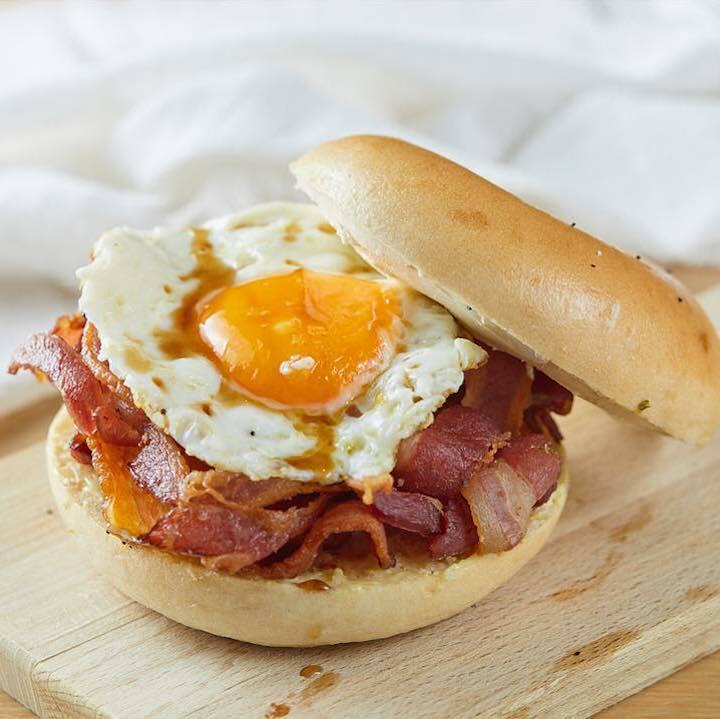 This NY-style deli serves up drool-worthy sandwiches all day, but for your morning fix opt for the fully loaded Breakfast Bagel (House Bacon, Scrambled Eggs, Cheddar Cheese, Butter Lettuce & Tomato), or the Sweet & Savoury (with Two Eggs, House Bacon, Pastrami Hash & French Toast). Although the Wan Chai location opens slightly later, and has a shorter breakfast menu, it’s still great for weekend indulgence. We recommend the Bagel & House Lox. This long-time Hong Kong classic is our go-to for all-American greasy food and runny, runny eggs. One of the few places that is open 24 hours and during T10s, the Flying Pan promises bottomless coffee, vintage vibes and shelter from the storm in its leather booths. The massive menu hosts a range of comfort food guilty-pleasures from oozy grilled cheeses (on toast or bagels), brunch classics and spiked milkshakes (maybe not for breakfast, though we’re not judging). Open from: 24 hours every day! A cosy and casual spot for any time of day, we love Brunch Club’s menu packed full of comfort food faves. The homemade bread and desserts here from Marie’s bakery are a must try, or for a more filling option, go for the Wing On Waffle with slow roasted chicken wings served on a crispy potato waffle (only in CWB location). Another great option for when you’re feeling a little fragile (or just hungry!) is The Diner. Lighter options include the Granola Sundae or the Morning After Smoothie, though we can’t refuse the Breakfast Burrito (with homemade Mexican chorizo, scrambled eggs, melted cheddar, sautéed onions in a flour tortilla with a side of pico de gallo salsa) or the Blueberry Buttermilk Pancakes. You may laugh, but how many of you have turned to the golden arches to cure a hangover? And with McDonalds on pretty much every street corner (and available for delivery!) you can’t go wrong. Did we mention McD’s in the 852 serves up its sausage McMuffin’s all day long? Feeling like a lighter grab and go breakfast before heading to the gym, or a healthier weekend option? Then Supabowl is where to head to. Found on Swatow Street in Wan Chai, this little shop serves up delicious and colourful made-to-order acai bowls. 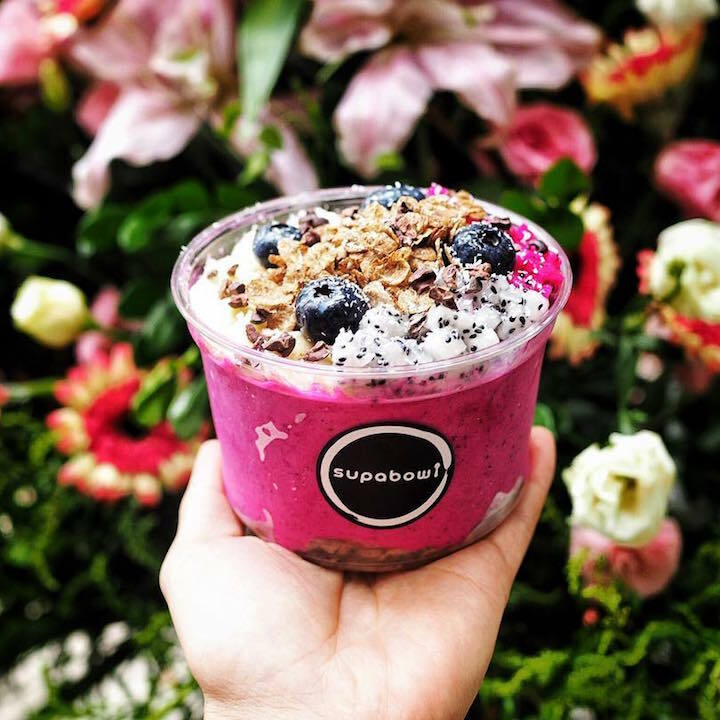 We’re partial to the classic Supabowl (signature acai base, with bananas, strawberries, blueberries and bee pollen), but the superfood options here are almost endless – just the thing if you need a healthy kick-start in the morning. 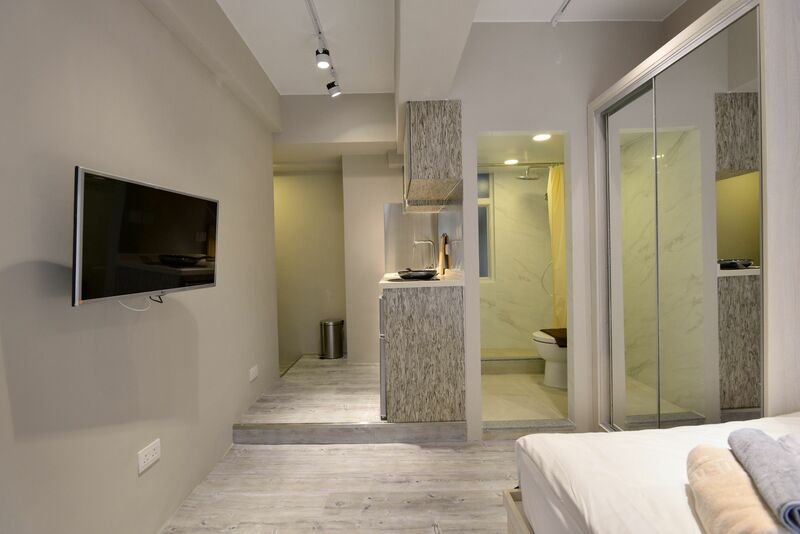 Serving up juices, smoothies, nut mylks, cold brew coffee and raw food, Genie Juicery is a one-stop destination for all things healthy in Hong Kong. Pick up a cold pressed juice post gym, or munch on some of the raw and organic food options. For a healthy sweet breakfast, that feels much more indulgent than it really is, go for the Chia Pudding and Cacao Mousse, or grab a slice or gluten and dairy free Banana Bread! Much more than just a juice bar (a great one at that), nood food is a healthy haven that’s perfect for a healthy bite on the go, or to sit in and savour. Its Cacao Chia Porridge is a sure bet, as is its Coconut Yogurt with Quinoa Puff Granola. Feel like something with a bit more bite? The hot food counter doesn’t disappoint with endless Paleo dishes along with responsibility sourced meat and fish. Acai Bowls are the order of the day at Be–Juiced, taking our indecisiveness to new levels with its endless combinations. Choose from toppings such as banana, mango, strawberry, dragon fruit, granola, cacao nibs and bee pollen, or opt for savoury or sweet bagels. You may know Commissary for its Taco Tuesday deal, but it’s also a great spot to take a group of friends for breaky. The freshly made pastries are hard to resist, but if you ask us, we’re going for the Huevos Rancheros every time. Just imagine a crisp tortilla, sunny eggs, avocado, tomato and chipotle and refried beans, washed down a with a Redback Coffee. A range of coffees and pastries are also available to go. 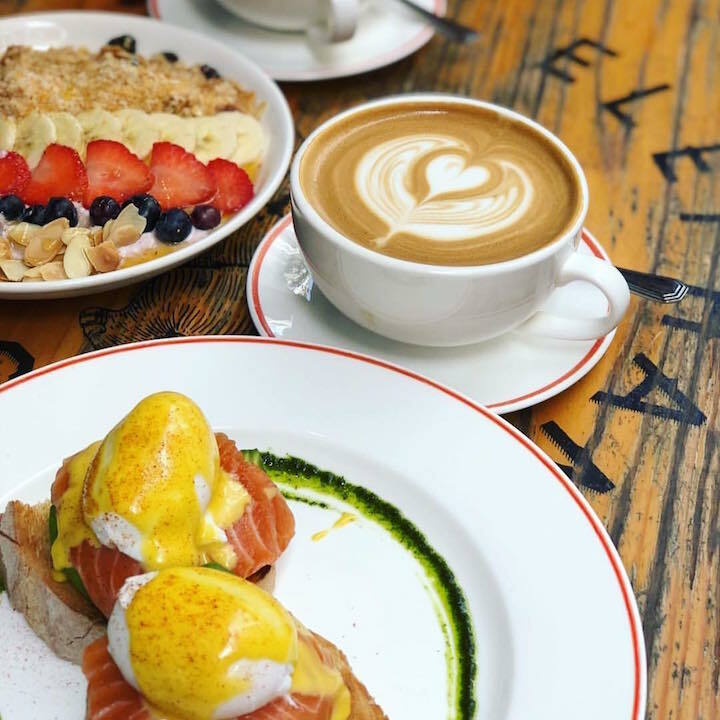 Located ever so conveniently in SoHo, Oolaa is an ideal brekkie spot for a weekend breakfast and catch up. Castelo Concepts is pretty hot on the breakfast game across all of its restos, and Oolaa is no exception with its extensive breakfast menu. From Fresh Fruit Muesli, to Eggs Benny and breakfast pizzas, you might well be able to please everybody here! If you’re after some flavoursome pork noodle soup ($35), and want to sit in a relaxed and casual space, head to Bing Kee. There’s a reason why the pork noodle soup is the best-selling dish, as it’s some of the tastiest I’ve tried anywhere. With juicy, peppery pork, greens, noodles and a flavoursome broth, it’s a delicious start to your day. Along with the food, we love this local dai pai dong for its cleanliness and friendly service, making it a real winner in our books. We may not quite be able to afford a stay at the exclusive Upper House, but we can sure enjoy its sophisticated breakfasts! Quality and class are the order of the day here, so you can’t go wrong with whatever you choose, with a menu including everything from Granola and Yoghurt, to Short-Rib Eggs Benedict, with Eastern options available, too. For the days when you have time for more than just a quick take away coffee, The Winery is a breakfast paradise. In addition to a beautiful juxtaposition of an indoor, outdoor ambiance that is relaxed and totally Instagram worthy, The Winery offers a beautiful selection of delicious breakfasts (that are equally IG worthy)! We are always happy with anything loaded with carbs – which is why we love its fluffy banana pancakes, dripping with a generous amount of maple syrup. The Winery also serves your classic Eggs Benedict, along with the trendy smashed avocado toast, so your breakfast here will always be a hit! 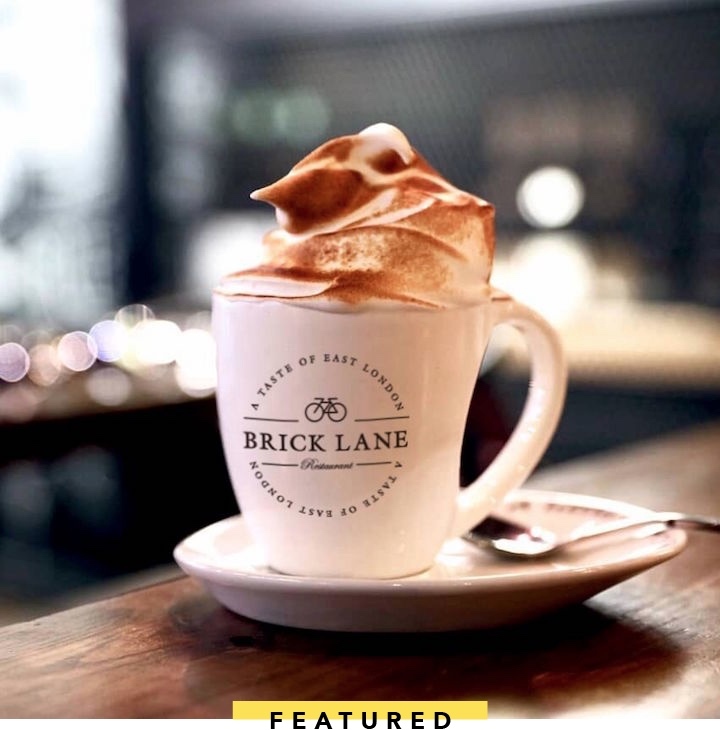 With three locations across Hong Kong, Brick Lane takes inspiration from proper British comfort food and all day breakfasts. 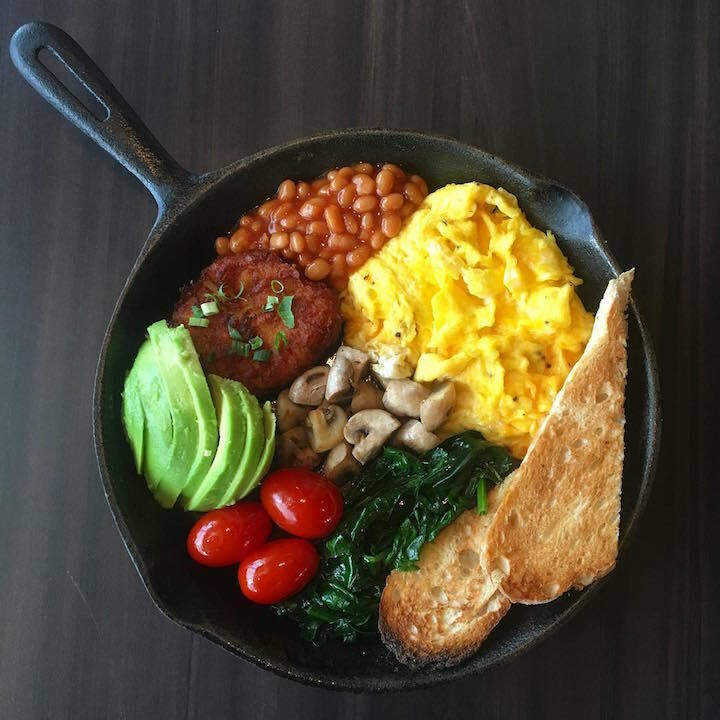 Expect a menu to please all, so round up your friends and try as much as you can, with eggs any way, skillet pancakes, a full English and more on offer. Crowned the cheapest Michelin Starred resto in Hong Kong, it’s so worth braving the queues for a delicious dim sum breakfast here. Even if your eyes are bigger than your stomach and you’re forced (ha!) to take the rest away, you’ll be shocked by how little the bill comes to. The Char Sui Pork Buns are a must-order, as is the Lor Mei Gai (glutinous rice) and crispy taro spring rolls. Looking to eat a little healthier? Grassroots Pantry is a must-visit for delicious, healthy and wholesome meals. The food holds no room for nasty, processed ingredients – but by no stretch of the imagination does that mean that it scrimps on flavour. Pop in on the way back from your morning run and indulge in nourishing favourites like Smashed Avocado and Free-Range Poached Eggs, Coconut Kefir Yogurt Parfait, Acai Berry Bowls and Lemon Chia Seed Pancakes. Capital Café never disappoints with its creamy scrambled egg, spaghetti bowl, and Hong Kong-style milk tea. Although we’re not the best morning people, the thought of devouring a fat piece of buttery toast at the bing sut genuinely makes us excited to get out of bed early. 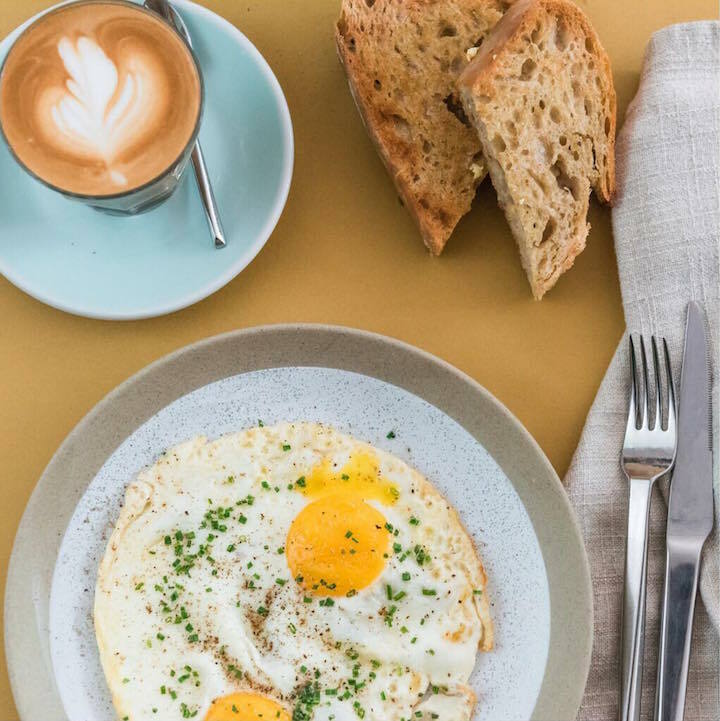 While Capital Café only offers one signature breakfast set, Hong Kongers can’t seem to get enough of it and keep coming back for more. With branches dotted all over Hong Kong, The Coffee Academics is always a good bet for a decent brew. Expect all the classics on its all-day breakfast dining menu, including smashed avo on toast with poached eggs, a full “Academics” breakfast and more. We’ve raved about the smashed avo on toast here on many occasions, but you know it’s good if we keep going back! The coffee is also good – which is the obvious draw so early in the morning, but its selection of egg dishes doesn’t go a miss either. 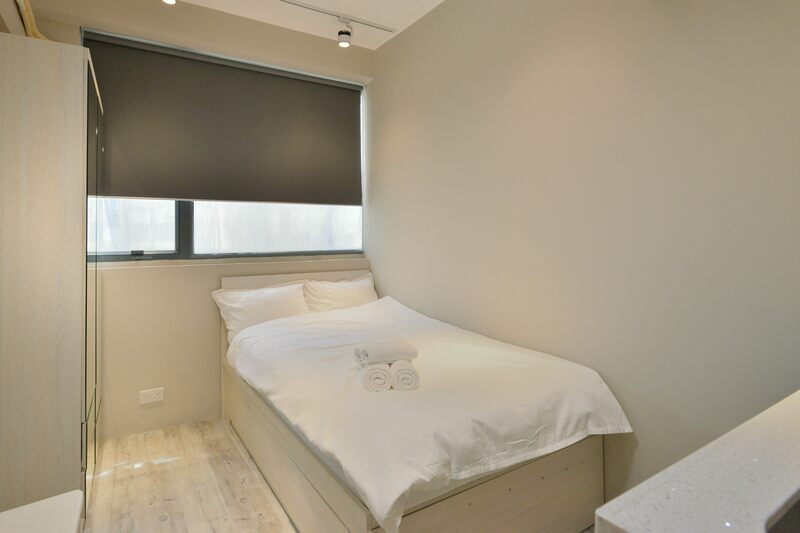 Looking for a quiet Wan Chai spot to get your head down and power through some emails (with a side of eggs)? Mansons’ brekkie sets range from $60 to $138 for a selection of toasts, eggs, pastries or bigger options, along with a drink of your choice. The vibe is quiet and cosy, perfect for a catch up with friends, or for getting a spot of work done outside of the office! This chic and breezy café will not disappoint. The décor is spacious and homey with comfy couches, wooden tables and you’ll always find something on the breakfast menu. There’s a big table upstairs so it’s perfect for a weekend brunch with friends, or to hide away with a coffee when you’re in work mode! Save room for dessert because you don’t want to miss out on the irresistible selection of seasonal cake. Tucked away on Li Yeun Street West, R&R Bagels is a place worth knowing. A super option for a working morning, or catching up over a coffee, though the seating area isn’t the biggest, it is cosy and away from the hustle of Central. A breakfast favourite of ours will always be the Maple Bacon & Egg – a mouth-watering mix of sweet smoky bacon (glazed with Noble Tonic No. 01 maple syrup), a runny egg and cream cheese. Open from: Monday and Tuesday: 7:30am to 5pm; Wednesday, Thursday and Fridays: 7:30am to 9pm; Saturdays and Sundays: 9am to 9pm (breakfast bagels served until 11am on weekdays and until 12:30pm on weekends). 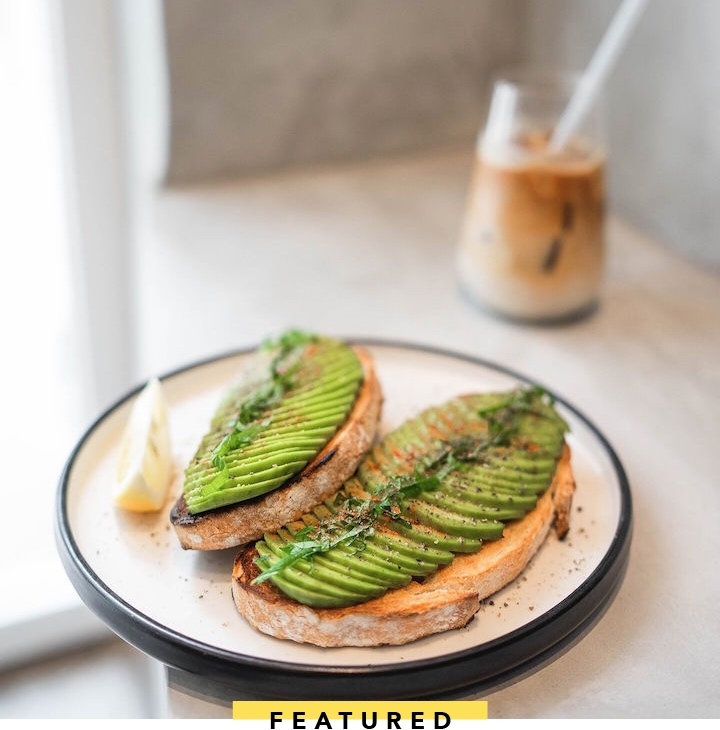 For the self-professed avocado toast and coffee enthusiast out there, Fineprint is an absolute dream come true: with not one, not two, but three kinds of avocado toast, you’ll be spoilt for choice at this Peel Street hangout! This chic little breakfast nook is reminiscent of Sydney coffee shops, but seamlessly fits into Hong Kong’s brekky scene as well. If you’re not an avo fan, the Smoked Salmon Bagel or Fig & Walnut Sourdough are equally solid choices – accompany your pick with a flat white and you’re set! The dimly lit interior is fairly cosy, but it’s easy enough to grab your brekky to-go or even sit outside on Peel street and people watch to your heart’s content.